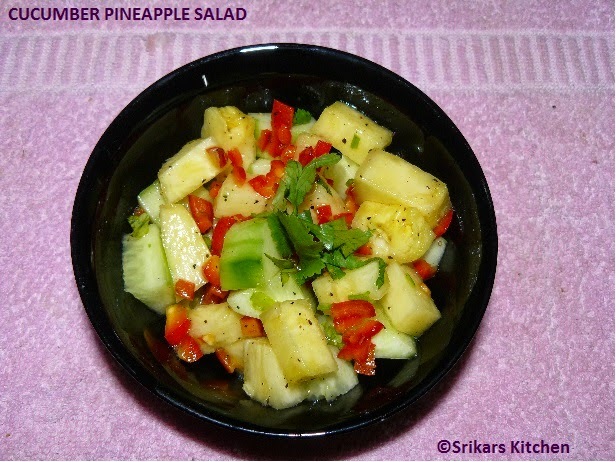 This is perfect refreshing salad & appealing & delicious, easy to make.This is healthy salad & cools down the summer effect.You can add finely chopped mint leaves for added refreshment or sweet red chillies to add a tinge. Salad is always a healthy option. Adding pineapple and cucumber is best of weight loss. Deskin the cucumber & pineapple. Keep it aside. Take a bowl. add olive oil, crushed pepper,salt,lemon juice, chopped sweet red chillies & mix well.This is the dressing of this salad. 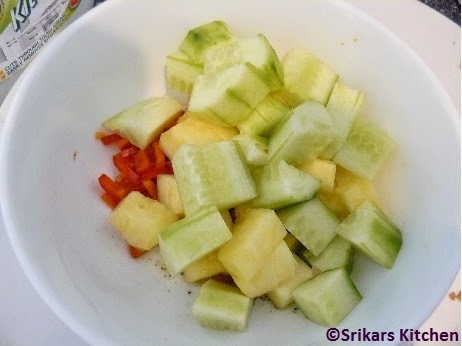 Add cubed cucumber, pineapple & mix well.